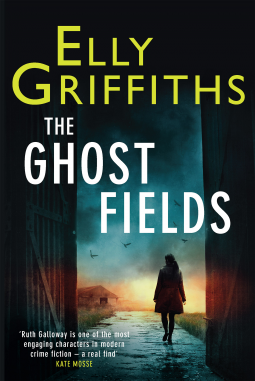 My post this week is book seven from a series that I love featuring forensic archaeologist Ruth Galloway; The Ghost Fields by Elly Griffiths. Norfolk is experiencing a July heatwave when a construction crew unearths a macabre discovery – a buried WWII plane with the pilot still inside. Forensic archaeologist Ruth Galloway quickly realizes that the skeleton couldn’t possibly be the pilot, and DNA tests identify the man as Fred Blackstock, a local aristocrat who had been reported dead at sea. When the remaining members of the Blackstock family learn about the discovery, they seem strangely frightened by the news. Events are further complicated by a TV company that wants to make a film about Norfolk’s deserted air force bases, the so-called Ghost Fields, which have been partially converted into a pig farm run by one of the younger Blackstocks. As production begins, Ruth notices a mysterious man lurking close to the Blackstocks’ family home. It is the hottest summer for years. A proper heatwave, the papers say. But Barry West doesn’t pay much attention to weather forecasts. He wears the same clothes winter and summer, jeans and an England t-shirt. It’s sweaty in the cab of the digger, but he doesn’t really mind. Being a man is all about sweat; anyone who washes too much is either a foreign or worse. It doesn’t occur to him that women don’t exactly find his odour enticing. He’s forty and hasn’t had a girlfriend for years. But he’s content, this July day. The Norfolk sky is a hot, hard blue and the earth, when exposed in the jaws of his digger, is pale, almost white. The yellow vehicle moves steadily to and fro, churning up stones and coarse grass. Barry doesn’t know, and he certainly doesn’t care, that people have fought hard over this patch of land, now scheduled for development by Edward Spens and Co.
Do you want to know more? Would you keep reading? Yes, I would – but I’m a bit behind with the Ruth Galloway series, there are a few earlier ones for me to read first. Barry West is not a very attractive figure is he? Not so sure about this one Cleo, but I might try a bit more. Oh, I’m keen to read this one, Cleo. I’m an Elly Griffiths/Ruth Galloway fan. And what an interesting mystery, too! Can’t wait to read your full review. I like mysteries with forensics, so I’d likely keep going. Thank you for visiting Beth – I’m enjoying it. I’m about 2/3 of the way through THE OUTCAST DEAD, the previous book and, of course, I absolutely will be reading THE GHOST FIELDS. I love this series. Interesting that I just finished reading the 3rd Peter May book set on the Isle of Lewis. There was a dead person found in a plane there too. I often find little links like that as I go from book to book. Love it. Oh you sound just like me finding links between books! I really loved The Chessmen (and the whole of this trilogy) I really enjoy this series and The Ghost Fields is no exception. The blurb and intro make me want to read more – enjoy! I would definitely keep reading. This series is new to me, and sounds like one I would enjoy. Of course I’ll be taking a look at book one–you can never read too many series, lol. This sounds intriguing! I definitely want to read this one. Adding it to my wish list right now. Oh that’s excellent news, I do hope you enjoy it! I am definitely curious! He sounds like someone who marches to his own drummer…LOL. This looks intriguing, so I’d keep reading! I love the color and details in the writing in that first paragraph. I hope it holds up tot the rest of the series. I would definitely keep reading. This sounds really good. This is a new to me series. I do like the sound of the opening.